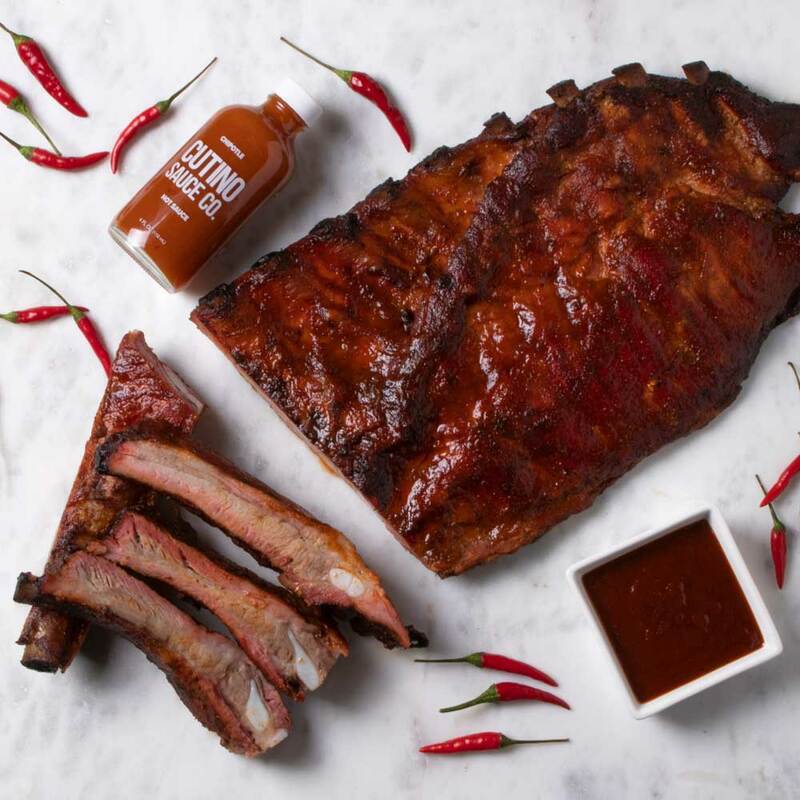 Smoked Chipotle BBQ Ribs - Cutino Sauce Co.
1. Remove silver skin from the bone side of the ribs. Combine all the rub ingredients together. Coat ribs evenly with half of the rub and wrap in plastic for 3 hrs or overnight. 2. Leave ribs out to come to room temperature before placing in the smoker. Smoke at 250F for 3 hours starting bone side up. *Flip ribs every 90 minutes and spray evenly with cider vinegar. 3. In a medium saucepan melt butter adding brown sugar, ketchup, tomato sauce & tomato paste and allow to come together over medium heat. Add the remaining sauce ingredients- 1 bottle of Cutino Sauce Co., 1/2 can of beer, other half of the rub recipe. Cover and let simmer for 1.5 hrs stirring occasionally. 4. Pull ribs from smoker and place on sauce covered foil. Pour a small amount of sauce on top of the ribs, wrap in foil and place back in smoker for another 90 mins. 5. Once 90 mins are up, pull ribs and let rest for 10 mins. Unwrap and sauce liberally. Cut and enjoy!